I'm not a sports guy. Like really really not a sports guy. I follow football (the American kind), but not actively. I don't really follow any other sports. There are days I couldn't even tell you what sports are currently in season. Because I just don't care. But I'm a sucker for sports-themed games. Even when that sport isn't football. I generally assume the Game Night crowd(s) are also sports-neutral folks. And - other than football - I'm usually correct. But not always. Side note: What is it about geeks and football? Is it because it's the sport that has the most visible strategic elements? Baseball has strategy - beyond "When on offense, hit the ball very hard. Run very fast." Soccer and hockey both have (surprisingly similar) strategies, as well. I don't follow it, but I do enjoy watching Formula One racing. And there are a handful of excellent F1-themed games, too. Like Formula D, for example. Or Detroit-Cleveland Grand Prix. Bolide came out in 2005, and I ordered it from Phoenix pretty much as soon as I saw it existed. 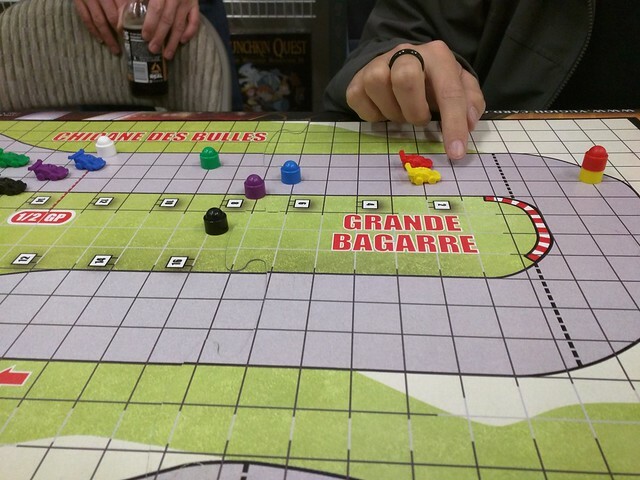 I struggled through the (awful) rulebook, and I did what I do: I brought it to game night. We played it a few times, liked it okay, and put it away. Because the rule book was (and is) so bad that there were game elements we couldn't figure out. Like how to make a pit stop. 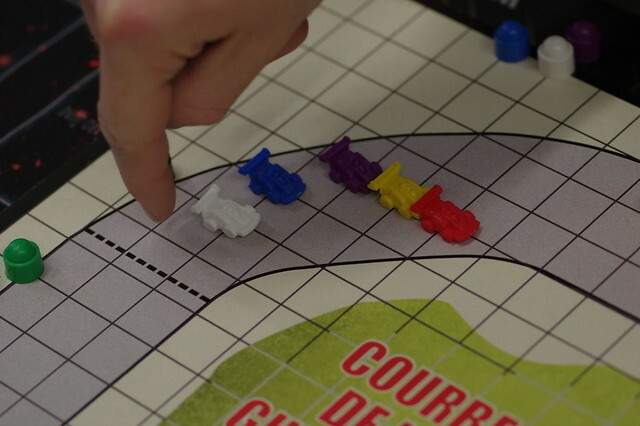 In a game about racing, rules for pit stops are critical to the strategy of the game. Since we couldn't figure the rules out, we missed out on a chunk of the available strategy, which made the game less-good. A few weeks ago, I was in the garage, and I spotted my copy of the game. I wonder if anyone ever fixed the rules, I thought to myself. Because I'll bet it has potential. I also wonder if I could figure the rules out. After all, I've spent the last decade, now, figuring out how to interpret translated rules text. A huge advantage over the 2005 me. I still couldn't figure the rules for pit stops out, but someone on Boardgamegeek re-wrote the rules and made them available for download. And they are a huge improvement. It got me itching to play again, so I packed it into the car, and we brought it to Game Night. I'd expected to get two or three people interested. I hadn't expected to have a seven-player race on my hands. We decided to play a simple game - one lap, so no pitting, no fuel concerns, and no tires. Just a simple "learn to play" lap. And it was a ton of fun. Bolide is an inertia-driven game. Each player has two pieces - a car-shaped piece and an inertia marker pawn. Each turn, your car must be placed within two spaces of the inertia pawn. Then your pawn is moved based on how your car moved. So if your car moved three spaces forward from its start space, then the pawn is placed three spaces ahead of the car. If your car moved two forward and one to the left, then the pawn is placed two forward and one to the left. In this photo, you can see that the yellow car is moving straight ahead, as is the green car. All of the other cars are starting to pull to the inside to make the curve. And most everyone is moving too fast. In fact, if I remember correctly, Red and Yellow both had to use one of their (limited) sharp braking maneuvers to survive the turn. Because it's possible shoot off the edge of the track. It's not a fantastic game, but it's a fun game. And it's challenging. And it's a bit of a competitive math problem, because you're trying to find your ideal position for each turn on the track. There is a best line for every starting position, and some of these best line cross over or intercept one another. When we played a few weeks ago, Green won. Green had started in seventh place, but planned his turns well. How far back was Green? You can see Green's pawn to the far left of this image from the curve before the Grande Bagarre pictured in the first image. Green's car is even further back. Something that's worth noting, here: the game is played not in the spaces on the board, but on the intersections. You can see that clearly in the second photo. Blue and White are both very limited in where they can go from their current spots (and, if I remember correctly, one or both of them had to brake sharply a turn or two after this shot was taken). But a one-lap race with inexperienced players took about two hours. So time is a definite factor. Hrm. I need to think on this.